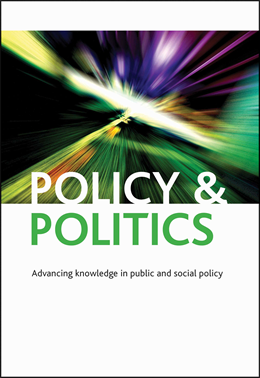 Policy & Politics has been publishing cutting-edge papers on public and social policy, and politics for over 40 years and is committed to continuing to advance understanding of the dynamics of policy- making and implementation. The journal’s co-editors invite proposals for themed issues that address some of the most critical challenges currently facing policymakers, and in doing so make a significant contribution to the field. Reflecting the significance and salience of these challenges, this call provides scholars with a unique opportunity to showcase new ideas and set the research agenda, with themed issues enjoying fast turnaround and prompt publication to maximise their impact. Read our new free virtual collection on Public Participation while you’re at ECPR 2018. All the articles are free to download from 20 August – 20 September 2018. Whatever your view on public participation, our new virtual collection brings you our most recent research on the topic from a range of different perspectives, all of which aim to enhance our understanding of its importance. Opening the collection is one of our most innovative articles that seeks to address the gap between evidence and policy on how population health outcomes are determined by health discourses. To explore understandings of the cause of ill health in two deindustrialised areas of Scotland, interviews with participants produced vivid articulations of the links between politics, policies, deindustrialisation, damage to community fabric and impacts on health, hence the title: Working-class discourses of politics, policy and health: ‘I don’t smoke; I don’t drink. The only thing wrong with me is my health’.